The jig plan guarantees your success! If you have shied away from mortise-and-tenon joinery because it sounds too complicated, take heart. With our tenoning jig and a little practice, you can turn out tight-fitting joints like a professional craftsman. We used birch plywood, and maple, but you can use a wood of your choice. A full materials and supplies list is included with the plan. 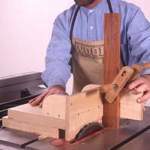 Tablesaw, clamps, drill press, random orbit sander, scrollsaw or jigsaw, bandsaw, and hand tools. The #31 series plans (plans that start with 31- ) are available in either paper or PDF download. This project plan is available in paper only and has full color pages with scaled templates that you can print onto 8-1/2 x 11 inch paper. It will be just like you are reading the magazine article itself! All building instructions and finishing guidelines included.